After a mad scramble to make it happen, we boarded the Skarda in great anticipation of a week at sea. Our Croatian island hopping itinerary had us visiting five or six islands over the course of the week and included cycling and hiking activities on each. We departed from Opatija, which is in the northern part of Croatia. Our trip around the world has been 99 percent planned and executed independently. We rarely use guides or have others book travel for us. To be honest, I’m usually against it, preferring to control what we’re doing, where we’re staying and how we’ll get there. But, by day 273 on the road, I was ready for someone to take over. And we found the perfect man for the job. Meet Bojan. The best person I could have imagined to take over our daily activities. Us with Bojan on our last bike ride. Bojan is a licensed tourist guide in Croatia and has a love for the outdoors (we got along smashingly). 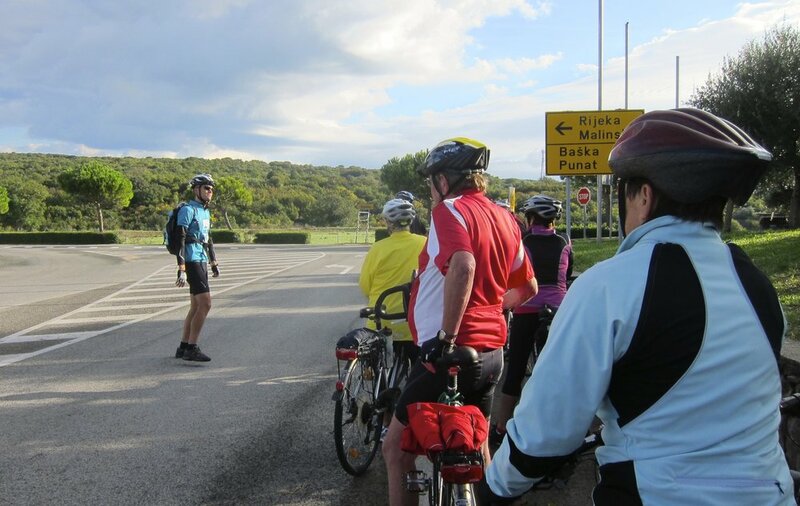 He is an avid cyclist and a hiker and also runs his own company to help promote these types of activities in lesser known parts of Croatia. Every morning, Bojan would take center stage at breakfast to explain the day’s activities. Since the group was all-German speaking except for us, most of what he said we pieced together by his hand gestures, though we came to learn two new words - wanderen (hiking in German) and radfahren (biking in German). We also quickly learned the worlds for lunch (mittagessen) and dinner (abendessen). We had a strong group of cyclists who always chose to add more kilometers to the route. Bojan seemed to love the challenge of adding unplanned cycling or walking to each day’s program. Mind you, I was the youngest person on the ship by at least 15-20 years. After watching this group of older active people for a week, I’ve vowed to never stop hiking or biking. They were all in amazing shape. Over the course of seven days, we biked close to 150 kilometers and walked at least 30. We followed Bojan up and over small mountains, along bike paths next to the sea and on a killer 55 kilometer bike ride from the island of Mali Losinj to the island of Cres. I never once had to look at a map or find the next trail. It was blissful. Enjoying a sunset stroll on the island of Krk. Bojan detailing the day's bike ride. A stop for wine tasting on a bike ride on Krk. Relaxing on the top deck as the boat leaves Krk. A local trying to tell our hiking group that we're going the wrong way! 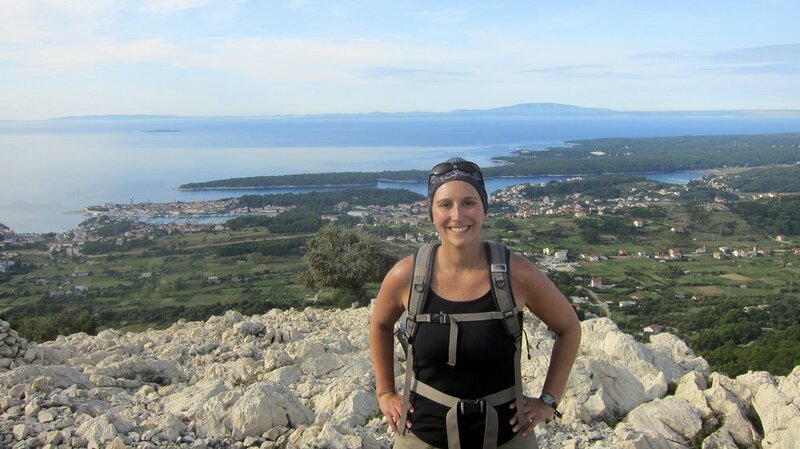 Hiking on the island of Rab, to its highest point. Hiking to the top of Mali Losinj with the entire island in the distance. A few kilometers left to go on the 55km ride to Cres. The village of Cres is below in the background. Our coastal cruise was on the Katarina ship line, which is one of the main suppliers of ships for island cruises throughout Croatia. In the middle of October, the cruise season was at an end, and our ship was only one of a few we saw throughout the week. Bojan referred to that time of year as “no season” rather than even “off season”. We got a nice deal on the cruise given it was the last voyage for the year. And while the weather wasn’t ideal for swimming, it was still warm enough to enjoy all our days, both on land and at sea. We were nervous about the cruise and if we would feel like we got our money’s worth, but between the meals provided, the ability to see a number of islands, having a room with literally an ocean view and the luxury of a great guide - we were more than satisfied with the week. It was a trip we will remember forever and I would highly recommend it to anyone who wants a more active way to see Croatia. There are plenty of trips that just sail without the added cycling and hiking, but we saw much more of the islands by pedaling and walking around them. -We were confused by all the operators who sell the cruises when searching online. We booked our trip through eWaterways (a cruise specialist out of the UK), but you can book directly with Katarina or the other local companies in Croatia. They all seem to have similar pricing. Most of the cruises are contracted out to Katarina or the other Croatian sailing companies. -Active trips like the one we took are only run in the spring and fall because it is too hot and busy on the islands during the summer months. -Pack light! The cabins are cozy and there isn’t much space for actual luggage. Soft-sided luggage will do you well. Bring your own toiletries and a beach towel if you plan to swim. Our cabin, which included an ensuite bathroom. -Be prepared for some extras. Typically, two meals a day are included in the price (breakfast and either lunch or dinner). The ship docks in ports overnight and you can eat at any of the island’s local restaurants. Drinks on board are not included in the price and you are asked to not bring any drinks onto the boat. Our ship had a poster with a tally of every cabin’s drinks over the course of the week so it helped us see how much we were drinking (and what it may cost) at the end of the week. We chose to drink off the boat for the most part to keep our costs down. -Many of the ports we docked at overnight had free Wifi in town. A definite bonus! -The food on our ship was good. Not great, but good. Breakfast is usually cereal, bread/toast, some type of meat or eggs, coffee, tea and fruit. Lunch or dinners were always filling with a soup, salad, entree and dessert. I liked that it was typical Croatian fare for lunch and dinner. -Just go! It’s a beautiful part of the world and this is a fun way to see it. You won’t regret it. If you are planning a trip to Croatia and want to incorporate activities like hiking or biking, I’m happy to pass along Bojan’s contact information. He’s a great resource and one of the reasons we liked our trip so much.